Teacher's WebFolder provides browser-based access to the MIS, enabling teachers to enter and review data from within the classroom, at home, or anywhere with an internet connection. Being browser-based means no client installation is required, and the system can be used with a wide range of browsers (Internet Explorer, Firefox, Safari, Google Chrome etc. 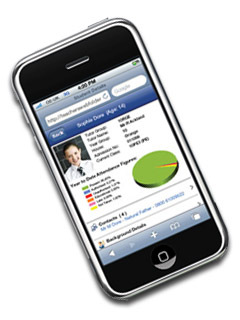 ), via a range of devices such as the iPhone, iPad, iPod touch, laptops, PCs, iMacs, Android and other smart phones. 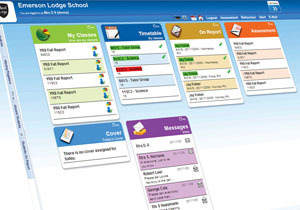 Teachers can take the register, monitor their class grades and behaviour as well as analyse and evaluate their class or individual pupil performance, all through an intuitive and user-friendly interface. And thanks to its intuitive nature, virtually no training is required to get staff up and running with the system. No client installation is necessary as Teacher's WebFolder integrates with your existing curriculum and/or administration network. It can also operate with two separate networks via a firewall between the two. Teachers are able to input and access essential pupil data such as their attendance, grades and behavioural events directly without having to rely on administrative staff. Data ownership is assured leading to improved data quality. As Teacher's WebFolder is a browser-based service, it can be accessed from anywhere. As long as you have an internet connection, you can catch up with work from home or anywhere else. Schools up and down the country have been asking for a portable solution for which there is Teacher's WebFolder Mobile. In some schools teachers have been pleading with the Senior Leadership Team to swap their laptops for an iPod touch an iPhone or a smart phone to use with Teacher's WebFolder, with one prominent school in Kent reporting that "... we have a growing number of staff with iPhones and iPod touches, many are now saying get me SIMS on an iPod touch and you can have my laptop back"
With Teacher's WebFolder SD you can record behavioural events into SIMS Lesson Monitor and/or SIMS Attendance. If it is in active use, assessment entries can also be made into SIMS Assessment Manager and SIMS Profiles. Teacher's WebFolder SD is implemented with the support of Capita's Technical Partnership agreement, using Capita's interface, which ensures 100% compatibility with SIMS.net. For more information and an online demo you can call us on 020 8290 7171. Operating at a level above the MIS are the Bromcom Galaxy modules. Teacher’s WebFolder provides browser-based access to the MIS, enabling teachers to enter and review data from within the classroom, at home, or anywhere with an internet connection. MyChildAtSchool is a user-friendly online portal for parents to access their child’s school data, including real-time attendance reporting, assessment and behaviour. The Bromcom VLE is a collection of essential teaching and learning aids for pupils and teachers, delivered via a secure web portal. Staff create Lesson Plans, Assignments and Quizzes for pupils to complete online. All three modules in the suite work individually as stand alone products, or combined to provide a comprehensive, fully integrated solution for entering, accessing and analysing pupil data.